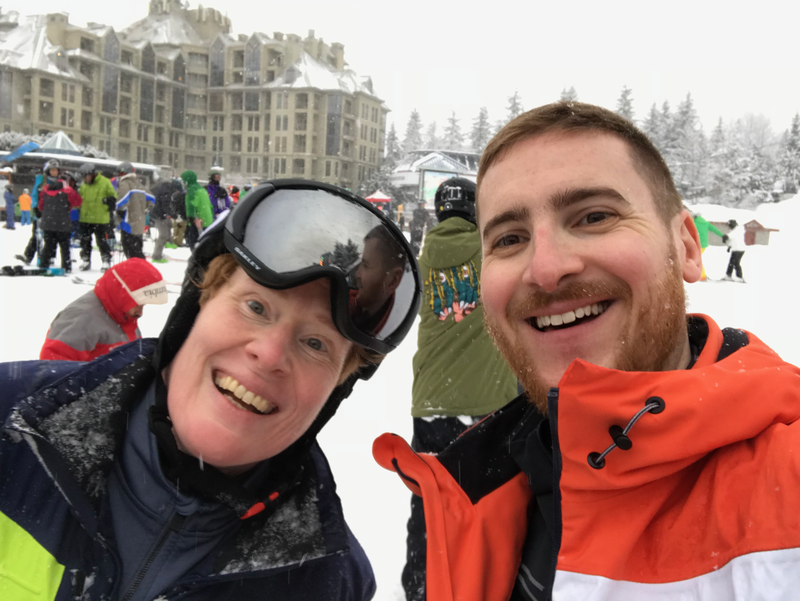 My amazing week at Whistler Pride. A couple of days ago I wrote about my fairly rubbish flight from London to Vancouver. 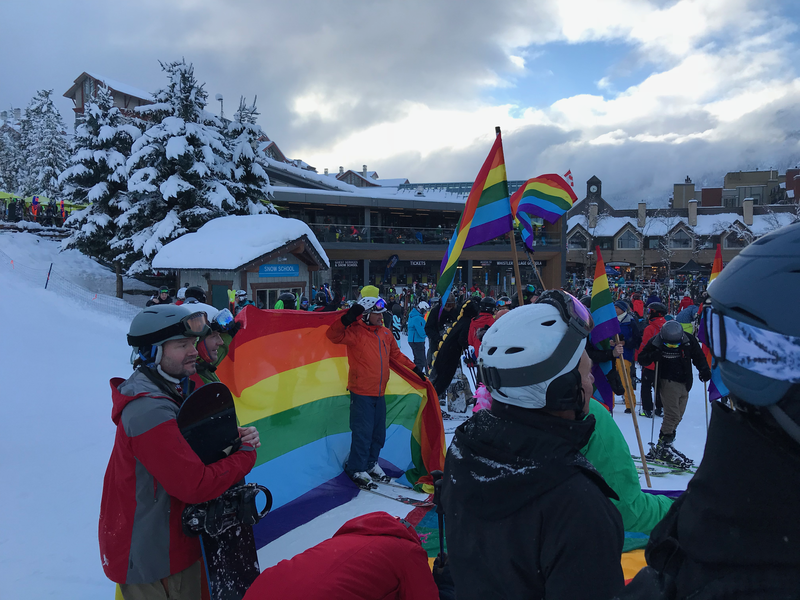 However the reason for the trip was to head up to Whistler in British Colombia for Whistler Pride, their gay ski week. I was lucky enough to have been there last year as well, and had such a brilliant time that I pretty much immediately booked again. So what is it? For me, first and foremost it was about making great friends to ski with. I thought that the single best part of the entire week was that every day, they offer free ski guiding on the mountain. 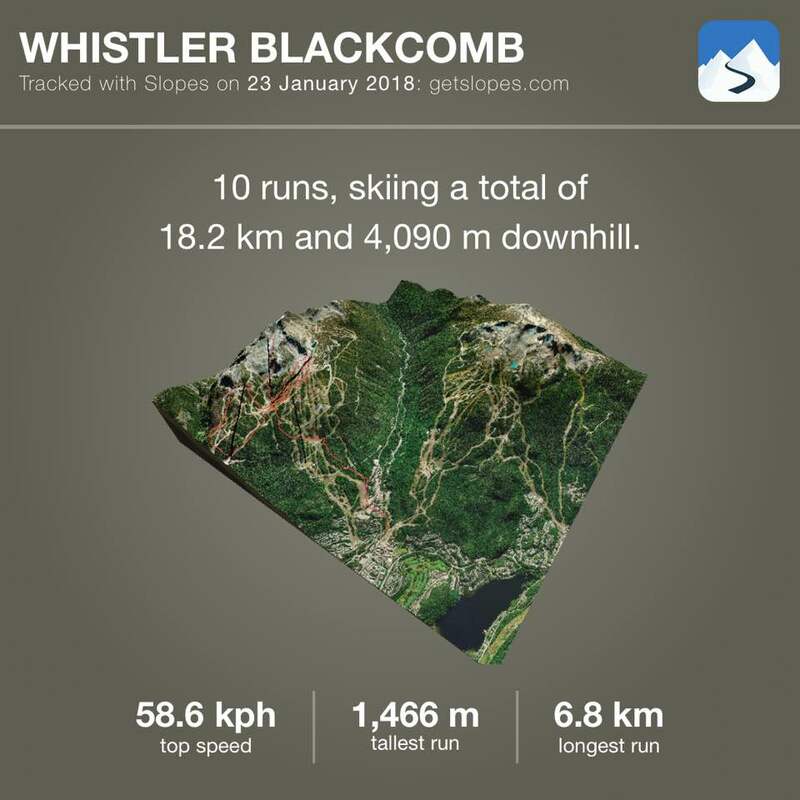 You’ll meet at either the top of either Whistler mountain or Blackcomb (they alternate every other day), and there’s a bunch of anywhere from 200 to 400 people. There are maybe 15 to 20 volunteer guides who each will take a group people based on their skiing ability. The guides will take groups from the easiest greens, all the way up to those that want to hike up into the backcountry and ski extreme double-diamond off-piste runs. Even snowboarders are welcome too 😉 with their own groups as well. Over the course of the week, you ski together across some of the best terrain in North America. It’s a great way to meet people, chat with them, swap tips, relax on the lifts and then have lunch. This year in particular it was snowing heavily for the entire week, almost non-stop. 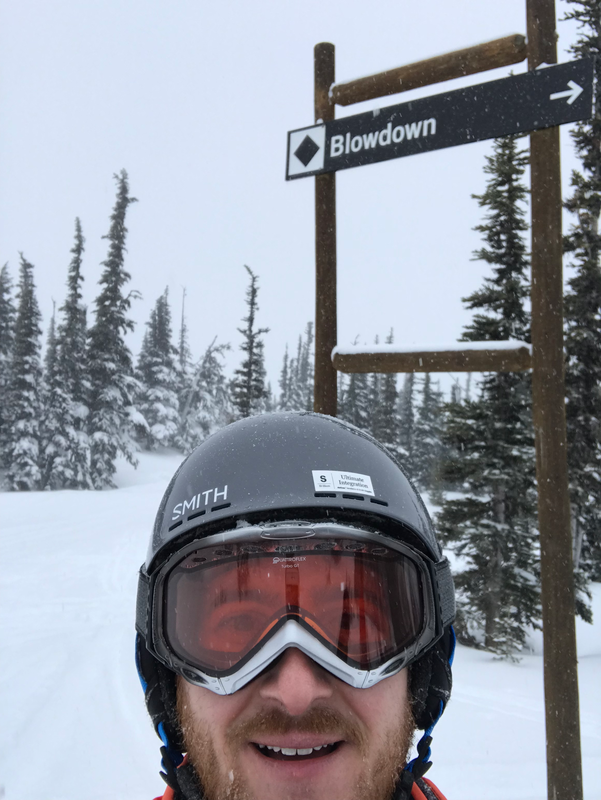 There was so much deep powder all over the mountain, it was one of the best weeks skiing I’ve had in 30 years. The guiding only goes until lunch-time, but then normally people will ski a bit more in the afternoon, going over where the guides took them in the morning, if they’re not already too tired. At the end of the day, there’s both official and un-official après ski. For the official events, you can either buy a pass for each event you’d like to go to, or alternatively a weekend or weekly pass. Being there for the entire week, buying a weekly pass meant that I could attend all of the events, excepting the pool party on Thursday night. The unofficial après ski events are just drinks at one of the bars with the people that you’ve been skiing with that day. Throughout the week, the organisers have lots of other events going on. The Tuesday evening included a visit to the Scandinavian style spa which we had entirely to ourselves, so no having to obey the strict rules they normally have around silence. It was packed out with a few hundred of us, and included a full bar service too. Wednesday night is comedy night, which this year was Margaret Cho (last year was Pam Ann). 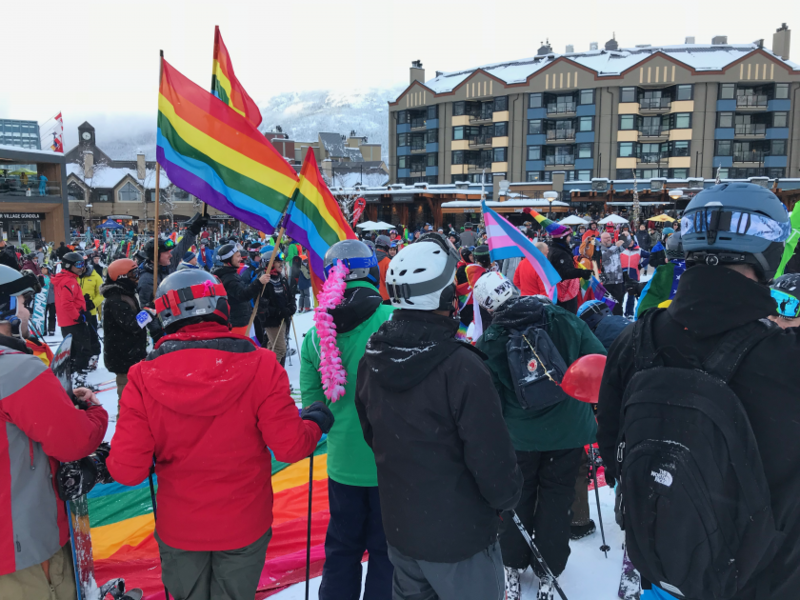 On the Friday afternoon, there’s even a Pride parade down the mountain, complete with a massive Pride flag, that’s skied down the mountain. 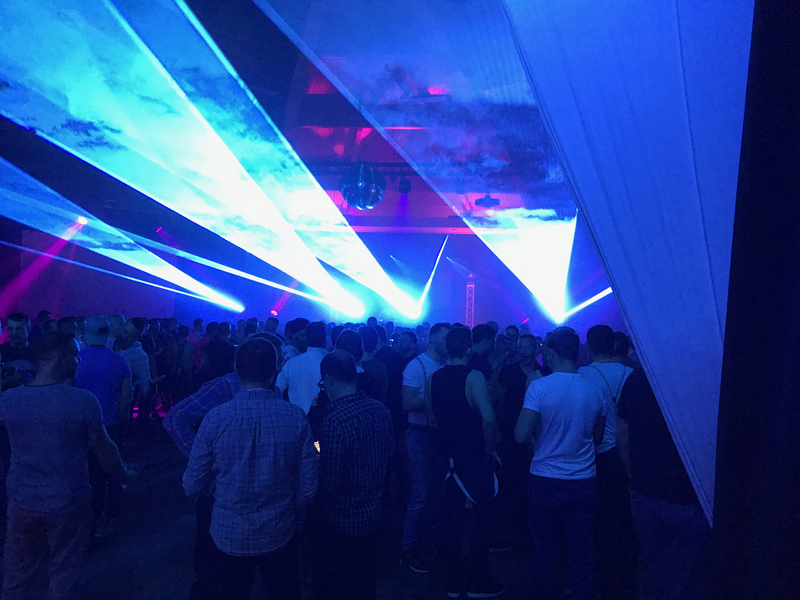 For the people that want to party, it has that as well, with both the Friday and Saturday evenings hosting a dance party going on until 4am. A lot of people come up from both Seattle and Vancouver for the weekends to attend these. In summary, it’s one of the funnest weeks I’ve had. Great skiing, great friends and partying is there if you want to go. A couple of nights I was so wiped out from the amazing mountain that I headed to bed at 22.00; but lots of people do that during the week too. I can’t wait to go back in 2019! Previous Post: Upgrading from Premium Economy to Business on American Airlines. Using Avios. Next Post: Shangri-La Vancouver. Really rather excellent.